This is a 1:25,000 scale map (defence overprint) of the region of Blitterswijk, Eastern Holland. It is the third edition of this map, published on February 6, 1945 by the Army Map Service of the United States Armed Forces. This overprint was referenced from air photographs taken January 14, 1945, and utilizes the Nord de Guerre Zone Grid (Blue). Production information for the base map is 5M/1/45/8RCE/5608. Production information for the overprint is 4M/2/45/3RCE/5611. 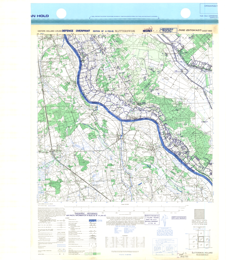 Historic military maps are an excellent resource for the study of the Second World War, and can also provide an excellent view of the changes that have occurred in the cultural and physical landscape. As this map has been georeferenced, it can be used in a GIS as a source or background layer in conjunction with other GIS data. Original paper maps were produced by various governments and mapping agencies during the Second World War, as part of the preparations for and immediately after D-Day (Operation Neptune). Paper maps were originally held by the Department of Defence, and were distributed by the Directorate of History and Heritage, Government of Canada, in the 1990s. Maps in this collection were acquired by the Laurier Military History Archive (LMH). Original paper maps were scanned and georeferenced at the University of Waterloo.